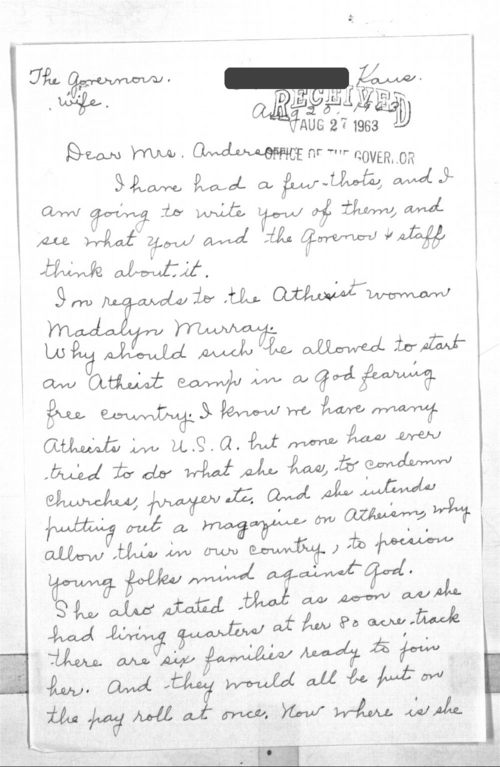 An anonymous Kansas resident writes the wife of Governor John Anderson Jr. of Topeka concerning a proposed atheist colony near Stockton, Kansas. The author expresses her opposition to the colony and regards it as a plot of communist Russia. Madalyn Murray [O'Hair] of Baltimore, Maryland, proposed the colony after the Supreme Court decision in Murray v. Curlett (1963) declared prayer in schools unconstitutional. Ms. Murray formed Other Americans, Inc. (a Maryland corporation) to advance atheist interests and establish an atheist colony in Kansas. Carl Brown, a farmer near Stockton and former Kansas state senator, served as a director of that corporation. Mr. Brown, an avowed atheist, deeded 160 acres of land near Stockton to the corporation. During the 1950s and 1960s, the national debate over the role of religion in public life centered on the use of prayer in public schools. Many people associated atheists with communists and approached this issue from the larger context of the cold war. Historical Society staff removed the author's name and place of residence from this copy of the letter to comply with her request for privacy. Collections - State Archives - Governor's Records - Anderson, John, Jr.
Government and Politics - State Government - Governors - Anderson, John Jr.